The original question was: What are the differences between man, apes and monkeys? I wish to share this with my teenage children to refute the evolutionary theory they are taught at high school. Apes and humans and monkeys are all classified as primates, and are considered by evolutionary biologists to be very similar. Apes and humans are commonly claimed to be genetically between 95 and 99 percent the same, but if you compare them you will see some very important differences, even in their basic body structure which are listed below, first for Apes and man, and then between apes and monkeys. 1. Relatively long legs compared with the trunk with the centre of gravity in the pelvis, just in front of the sacrum. 2. An S-shaped curved spine so that the head and trunk are balanced over the centre of gravity. This combined with the outward facing shoulder means the arms rest beside the trunk. 3. A wide curved pelvis providing large attachment sites for strong abductor and rotator muscles needed to raise the pelvis and swing the legs under it. A large hip joint with its mechanical axis in front of the line of gravity. This means that the most stable position for the hip is full extension, i.e. upright. 4. A large, forward facing knee joint, aligned under the hip joint with its mechanical axis behind the line of gravity. This means that the most stable position for the knee is also full extension, i.e. upright. 5. A plantigrade foot, i.e. heel and toes both on the ground, with a large heel, and the foot bones arranged in lengthways and side-to-side arches. This distributes the body weight evenly between the heel and toes and provides some elastic recoil when walking. 6. A large first toe (“big toe”) tightly bound to and aligned with the other toes, with the toes being short and straight. Apes have none of these essential features. Apes have short legs, a long trunk and long arms (longer than their legs) with their centre of gravity high in the trunk. This makes them top heavy and unstable without using their arms for support. Their spines lack any convex forward curves needed to balance the head and upper body over the centre of gravity. The head and arms tend to swing forward. Their knees and feet are turned outwards and their hip and knee joints are aligned so that they bend with gravity. Although apes have a plantigrade foot, it is not arched, and the big toe is separate from the other toes, like a thumb. Their toes are long and curved. There is no functional half-way combination of apes’ quadruped stance and human bipedal stance. The semi-stooped posture depicted in evolutionary drawings is hopelessly unstable and would require enormous expenditure of muscle energy to maintain it. Humans can stand upright with very little muscle contraction required because their bones are joints are arranged in a balanced way around a vertical line through their centre of gravity. Human arms and hands are designed for manipulating objects. The shoulder girdle holds the arms beside the trunk and is capable of a large range of movement. The shoulder joint is very flexible and not designed to hold the body weight. The hands have long, straight fingers and a large straight thumb that can oppose the tips of all the fingers. Ape arms are large and strong and designed for weight bearing. The clavicle (collar bone) slopes upwards so that the shoulders are beside the lower jaw. Apes’ hands are quite good at manipulating objects but must share the load in locomotion. Apes have large hands with long, strong curved fingers used for knuckle walking. Their thumb is short and cannot completely oppose all the fingers. Humans have short, sparse hair all over their bodies but it varies between individuals, racial groups and between males and females. Humans have hair on their heads that grows to be over a metre long if not cut. Males of most races have long hair on the lower half of the face if this is not shaved. Male pattern baldness affects the scalp hair of some males but not facial hair. Human hair is believed to be a vestigial leftover from when we were hairy apes. However human hair has several functions and shows evidence of design. For more details see the Question: Why is the human body covered in hair? Apes have short, dense hair all over their bodies except for their faces where it is thin and sparse. Apes do not have beards or suffer from baldness. Humans and apes both 32 teeth with the same combination of different functional types – incisors, canines, premolars and molars. However, ape and human jaws are different shapes. Human jaws have parabolic shape and the teeth and jaws are much smaller than any ape’s. The canines of humans are the same height above the gums as the other teeth. Ape jaws are rectangular and have large prominent canines. In general apes are vegetarian, living on fruit, leaves and young shoots. Humans have a chin. Apes do not. Human faces are vertical in profile due to the large cranium and small jaws. Human noses are narrow and project downwards. Ape profiles slope backwards due to the large jaws and small cranium. Ape noses are relatively wide and flat. A chimpanzee cranial capacity averages about 400 cubic cm whilst human cranial capacity averages around 1350cm. There is quite a deal of variation in humans and brain size does not indicate intelligence level. Bipedal gait (two legged walking) and manipulative hands can only work if the muscles are controlled by the nervous system. The control of posture and gait involves built in circuits in all regions of the nervous system. These automatically work for upright stance. Babies do not progress from crawling to bipedal gait by copying adults. The circuits are built in. They merely have to wait for sufficient strength to develop in the legs, and for their nerve fibres to be covered with the insulating layer needed to conduct rapid electrical signals. The largest difference in brains of apes and humans is in the cerebral cortex. This is part of the brain that control conscious awareness and understanding, conscious control of movements and learning and memory. In humans this includes language, numeracy, artistic and craft skills, judgement and forward planning. These functions take up most of cerebral cortex in humans. Apes are capable of learning and memory and communication but not in the same way as humans. Apes can communicate with vocalisation and gestures, including facial expressions. They can also be taught to recognise symbols and use them to communicate. However, they do not have the nervous system control needed for speech and writing. All attempts to teach apes to speak have failed. In humans speech is controlled by two large sections of cerebral cortex in the parietal and frontal lobes. These have many connections with other parts of the cortex and with each other. Apes do not have these specialised functional areas or the extensive connections. The ability to speak is built into human brains. Children acquire, rather than mimic, the language they are exposed to as infants, i.e. the potential to speak any language is hard wired into the brain. The child’s brain takes in, analyses and re-synthesises the language it hears. There is evidence that numeracy and an appreciation of music is also “hard wired” into the brain in a similar way. The muscle control needed for speech is very complex and comes built into the human brain. Speech involves precision control of breathing muscles as well as the face, tongue and larynx. This does not exist in apes, neither does the precision control of the arms and hand required for writing and drawing. Can apes be taught to be human? Chimpanzees and gorillas live in social groups and show complex social behaviour, but attempts to integrate them into human society have failed. The chimps you see doing clever things in TV programmes and films are juveniles, usually less than eight years old. Juvenile chimps are quick to learn, and are amenable to human handling, but an adult chimpanzee is a large and dangerous animal. Adult chimps are far stronger than humans even though they are of similar size. All apes are essentially wild animals, and although they can be kept in captivity they cannot be integrated into human society. Man and Ape are actually so different they are truly unrelated, which is exactly what you would expect given that God declares He made man separate from all the other creature on the sixth day of creation. ( Gen 1:26-31). Many people confuse monkeys and apes. Monkeys include a large number of species that have “monkey” in their name, e.g. rhesus monkey, patas monkey, langur monkey, but also include baboons, mandrills, macaques and marmosets. They are quadrupeds with a tail. Monkeys are classified into two groups – New World and Old World monkeys. These terms refer to their geographical location in the wild. New World monkeys live in Central and South America, Old World monkeys in Africa and Asia. There are also some anatomical and behavioural differences. New World monkeys have a flat nose with wide apart nostrils, three premolars and two molars, a short thumb aligned with rest of the fingers and a muscular prehensile tail. Old World monkeys have a narrow downward pointing nose, two premolars and three molars and a short partially opposable thumb. Their tails vary in size and muscularity, and they often have ischial callosities (hard callused patches on their rear ends). Most monkeys live in forests although some Old World monkeys live in savannah and semi-arid environments. Apes include chimpanzees, gorillas, gibbons and orang-utans. They have long, strong upper limbs, short lower limbs and no tail. How different are monkeys and apes? The main differences between monkeys and apes are in their locomotor systems, i.e. bones, muscles and joints. Although monkeys and apes both live in trees, they move about them very differently. Monkeys move about like other quadrupeds. They have a long muscular body and use their tails for balance. New World monkeys use their prehensile tail to help move about and support their body weight in trees. Monkeys’ forelimbs are a more mobile than those of a ground dwelling quadruped, e.g. a dog, but they do not swing on them like apes. Their shoulders are small and narrow. They cannot straighten their elbows completely, and have restricted movement of the forearm and wrist. Apes have large, flexible shoulders, elbows that can fully straighten and a large range of movement in the wrists and forearms. To move quickly through trees they brachiate – swing from branch to branch, easily supporting their body weight on their arms. On the ground apes are knuckle walkers – supporting their weight on the backs of their curled fingers. Their molar teeth are different. Monkey molars have four cusps, ape molars have five. Monkeys do not have an appendix, but apes do. 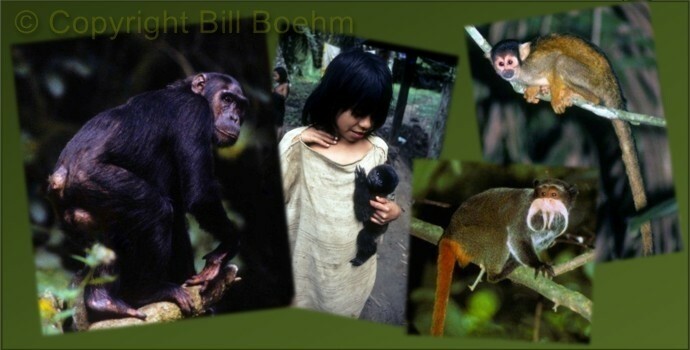 These basic differences between humans, apes and monkeys remind us that God created living things in separate kinds. Human beings are unique creations made in the image of God, and will always be separate from apes or any other animals. Useful resources to help children learn about man and animals. In the Image of God A fun children’s talk by John Mackay . Unlocking the Mysteries of Creation by Dennis Petersen An excellent book for all the family on Creation, Noah’s flood, the Tower of Babel and the early history of human civilisation. Photos by Bill Boehm. Used with permission.